(Bloomberg) -- By some measures, Turkish stocks are the cheapest in decade after a lira shortage engineered by the government spurred the worst slump since a failed coup in 2016. A four-day, 11 percent rout in the Borsa Istanbul 100 Index sent its valuation to the lowest level since 2009, as investors dumped equities after the government made it virtually impossible for them to sell the local currency. The gauge now trades below 5.7 times projected earnings, only a shade better than 5.6 for Russia, the cheapest emerging market. Low valuations aren’t necessarily an argument to buy stocks, as they may be cheap for a good reason. The current bout of selling in Istanbul stocks is fueled by investor panic over the lira, and that may continue to weigh on the market. 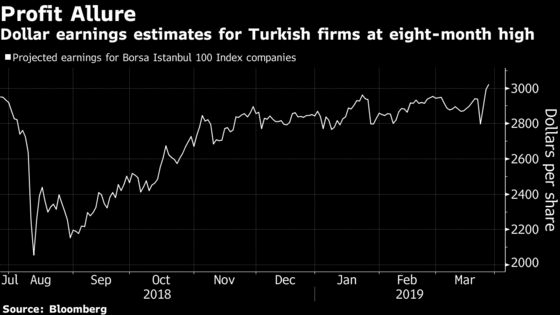 Still, analysts are raising profit estimates for Turkish companies, suggesting juicy valuations may be an opportunity to return to Turkish stocks. Even as the lira heads for a second monthly decline, analysts’ estimates for Turkish earnings in dollar terms have risen to an eight-month high. The action is spilling over to the U.S. exchange-traded funds market. 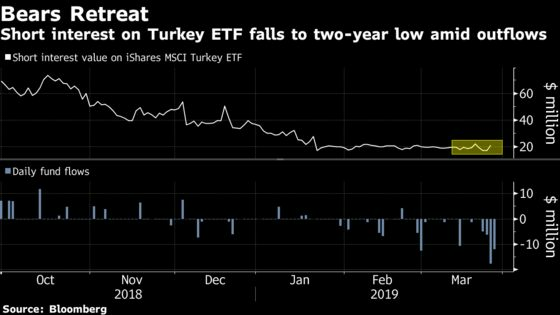 While the iShares MSCI Turkey ETF has witnessed the worst outflows in a year, in line with the sell-off in Istanbul, short traders are becoming less confident. Wagers for declines in the fund fell to about $17 million on March 22, the lowest level in two years. The benchmark stock index fluctuated between gains and losses on Thursday, trading 0.9 percent higher at 2:07 p.m. in Istanbul. 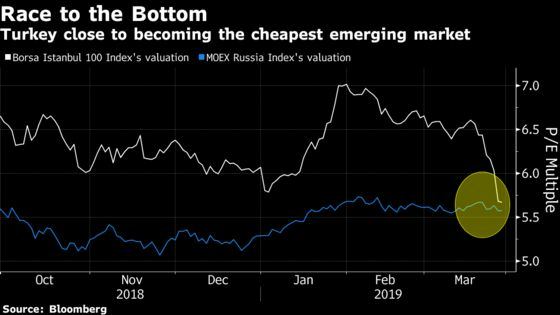 Whether or not the measure falls below the MOEX Russia Index’s valuation, it already offers an earnings yield of 17.5 percent, not much lower than the 18.96 percent return on Turkey’s 10-year government bonds.